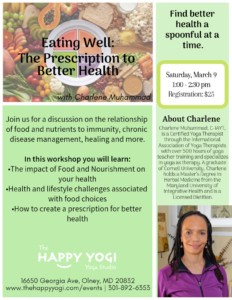 Join us for a discussion on the relationship of food and nutrients to immunity, chronic disease management, healing and more.. Discover nature’s keys to unlock the door to your personal health and wellness! This workshop explores the interconnections between yoga, Ayurveda (its sister science) and herbal medicine, and how they link together to create personalized maps to support optimum wellness. You will learn ways to support your own health and to guide your students and clients to understand their individual and unique energetic qualities and the practical ways to apply yoga and Ayurveda to better manage health and wellness that is in balance with nature’s cycles and rhythms. Yoga Alliance CEUs available upon request. Saturday, April 27, 2019 1:00 -5:00 pm.